Evil lurks in the heart of Salem. But is it witchcraft, the Devil, or just the bitterness and envy of your friends and neighbors? This is the first Kingdom seed release from the Kickstarter campaign. It’s inspired by Peter Adkison’s new short film The Devil Walks In Salem, which was itself based on the fantastic Salem Fiasco game I played with Caroline Hobbs, Jerome Virnich and Pat Kemp. 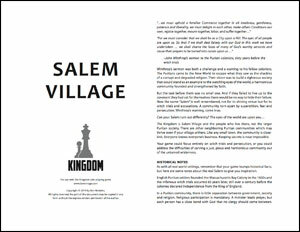 Could you really ask for a juicier Kingdom than Salem Village? A community striving to be a model of righteousness but torn apart by fear and superstition? Truth to be told: in the original game, our Salem didn’t turn out too happily. Bad stuff happened to good people. When you watch the movie, you’ll see what I mean (no spoilers!). Can your Salem turn out differently? Play and find out.